Star Wars: The Old Republic is getting some freebies for Star Wars Day, too. May 4 is coming, and if you say it out loud—“May the fourth”—you will will realize, in a sudden burst of clarity leavened with an internal chuckle at the wonderful cleverness of the modern marketing, that it is Star Wars Day. And at 11 am PT on that day, you will be given the opportunity to leap into Star Wars Battlefront and play it for free, for four hours. The free trial will be available indefinitely, and assuming it works like other Origin trials, the four-hour limit is based on total playtime, and not a timer that starts counting down the moment you begin. (I've emailed EA to confirm this.) It includes access to the full base game, but not the Outer Rim DLC or any future expansions. Players who log in on Star Wars Day will be given 4444 in-game credits to spend, and there will also be a new Hutt Contract that will unlock the health-boosting Bacta Bomb Star Card. If MMOs are more your thing, Star Wars: The Old Republic is also serving up some freebies, including access to the Knights of the Fallen Empire expansion through May 30, the M4-I6 Zakuulan Astromech Droid in-game pet for logging in between now and May 4, and double XP from May 3-10. Details on EA's Star Wars Day offerings are available here. 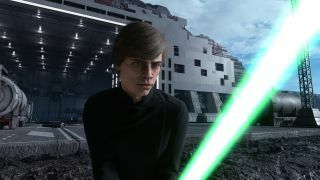 Ahead of the freebie fun, an update to Star Wars Battlefront will be rolled out at 11 pm PT on May 3 which will make “a host of fixes and updates to the game.” EA said the update should not result in extended downtime. Update: EA has confirmed that the four-hour time limit is cumulative playtime, and can be stretched out over multiple sessions in whatever portions you see fit.